[June, 2017] This review is on an older release that was bottled somewhere in the nineties. I bought this bottle for 35 Euro. No bottling date stamp on the bottle as with newer batches but the code JA/BJF. The colour is tawny (looks like a high share of sherry casks in this batch, that is why I bought the bottle) and the texture shows medium fast legs and late fat sticky tears. The nose is on a rich paxarette-improved sherry (like many old Macallan) so this whisky has been casked in 1989 latest (as the Scotch whisky industry banned the use of paxarette then, one of their stupiest laws). The nose is not very complex but if you just like to drink your dram this is perfect (rich, impressive, untamed). By the way, not the slightest trace of sulphur what is another hint of a rather old batch. The arrival is mellow and warming with no distracting feelings, but not very much coating as well. The taste is very sherry-sweet - almost like sipping an ultra-rich sherry wine. Not much left of the Miltonduff whisky (that is why they banned the paxarette after it was used in too much quantities like here) but hey - if it tastes that good I do not need the Miltonduff distillery profile on my palate. The finish is very long and virtually stays forever, no bitter or drying moments. Malty, without sherry influence. Not wrong, but nothing special. Rich noise that fills the room; floral caramel with light vanilla. Not very complex, but rich. Palate; sweet and pleasant. Not much of a finish. Hard to pick out tasting notes. Would need more time with such a fine dram. 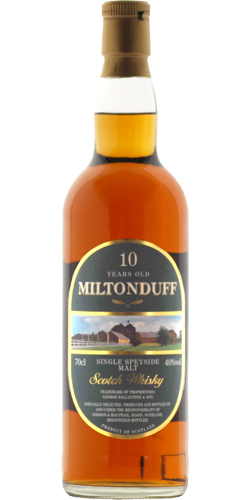 A frequently overlooked distillery is Miltonduff, independent bottlers have repeatedly brought interesting bottles on the market. This can almost be considered as a standard bottling. The single malt finds otherwise another use - he is one of the main components of the "Ballantines" -Bl ... ends. Nose: Very mild, a bit floral. Clear hint of vanilla. Light aromas of lemongrass. Palate: Powerful, despite the low drinking strength. With pepper and spices, with bitter oak notes: coffee and chocolate, as well as citrus fruits. Pretty dry matter. Finish: medium and strong, slightly soapy and floral, juicy nut flavors in the back. Conclusion: Unfortunately, the nose is not very complex, palate and finish are very pleasing.